A coming-of-age high school dramatic comedy, The Breakfast Club is a sharply defined study of five memorable characters under stress. With the feel of an intimate play and career-defining performances from the young cast, director and writer John Hughes established his reputation as the voice of youth and mentor for a new generation of actors. It's Saturday in suburban Chicago, and five Shermer High School students have to spend the entire day in detention as punishment for poor behaviour. Andy (Emilio Estevez) is the jock on the school wrestling team, Claire (Molly Ringwald) is the princess primarily interested in shopping and make up, Bender (Judd Nelson) is the psychological bully from a rough home, Brian (Anthony Michael Hall) is the nerd, and Allison (Ally Sheedy) is just weird. The five barely know each other. Under the supervision of assistant principal Richard Vernon (Paul Gleason), they are confined to the library for the day and ordered to write a 1,000 word essay each. But with Bender as prime catalyst and mood disruptor, they do little writing and plenty of talking. Initially the conversations are difficult and confrontational, and there is plenty of teasing, insulting and acrimony. But over the course of the day, they get to know each other, including uncovering family backgrounds and the reasons why they all ended up in detention. As they try to stay one step ahead of Vernon's authoritarianism, the green shoots of respect and understanding begin to appear within the group. 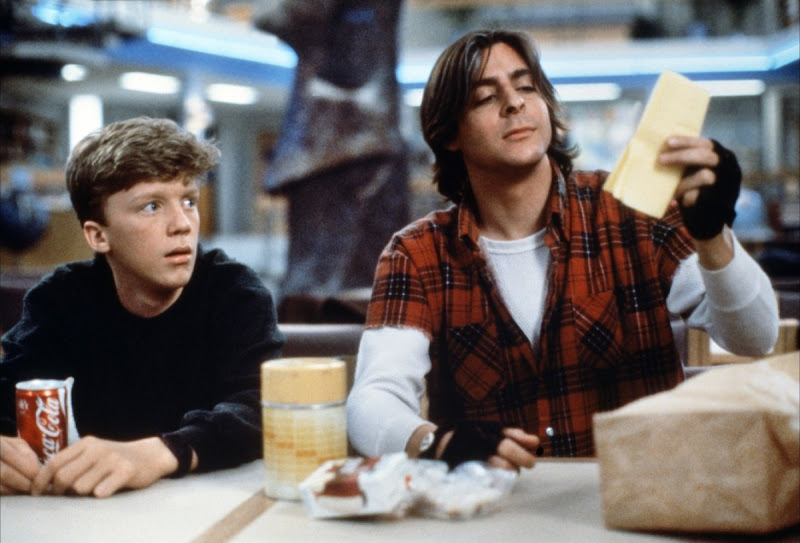 Written by Hughes and pulled together as an ensemble piece on essentially a single set, The Breakfast Club delves into the anxieties of teenagers, scraping away the hardened outside shells to find real people inside. As the external postures are stripped away, surprising commonalities are found, emotions are shared and previously unthinkable bonds are allowed to form under the umbrella of shared burdens. 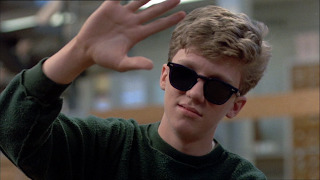 The Breakfast Club is not without its creaky moments. The pacing is episodic, with the emotions and confrontations that are laid bare in one scene frequently all but forgotten in the next. And the ending, with sudden attractions materializing, appears rushed and predetermined for the sake of generating some warm kisses and unconvincing romantic sparks. And assistant principal Vernon is just too deserving of any trouble that the kids manage to dish out. But to the sounds of what became the generational anthem Don't You (Forget About Me) by the Simple Minds, the five young actors overcome the weaknesses in the script with outstanding performances, Judd Nelson leading the group. Bender is the troubled kid convinced despite all contrary evidence that he is tougher than his surroundings, and Nelson plays him with a cool eyed intensity that never wavers. He is merciless in picking on Claire, but is smart enough to stop just short of assaulting Vernon when fully afforded the opportunity. Nelson explores the coiled internal tension that only comes from an abusive household, as Bender's restlessness means that he cannot help but stir things up to spread the misery. Hughes explains Bender's attitude but never softens him up into a victim or a potential reformed kid. Molly Ringwald, just 16 when filming The Breakfast Club, embodies every popular, rich, pretty girl more interested in friends, shopping and hanging out than reaching out or stretching academically. Ringwald brings a tough naiveté to Claire, a privileged girl fully enjoying the entitlement of coasting through high school and not having to deal with neither effort nor kids like Bender. On this Saturday Claire has to share time and space with a group of students that are typically beneath her, and Ringwald conveys vulnerability as an easy target but also a gradual awakening to new realities. Allison is the most opaque character, and Ally Sheedy nails the dark kid who hovers like a ghostly presence at the back of the room. Allison is the slowest among the group to reveal herself, and she just gets weirder and more interesting the more she opens up, the pieces of her puzzle adding to the confusion rather than assembling into a whole. Andy and Brian are the relatively straightforward personalities, Emilio Estevez projecting uneasy conflict as he walks the line between being trying to be cool and stepping in to protect Claire from Bender's browbeating. Anthony Michael Hall further develops his screen nerd persona, trying to fit in but always just a little bit clumsy in his social interactions. Andy and Brian find common ground when they both admit to the enormous pressure they feel from their parents to perform, Andy on the wrestling mat and Brian on all his exams. In baring the souls of five disparate characters, The Breakfast Club shines as a unique examination of the teenager, and as an impossible to forget film experience. By the accident, I firstly saw this film yesterday (the day before I firstly saw Bueller) and I wasn´t as excited from this film like from Bueller, which simply blew me away with everything. This film looked very aged to me, all the 80s stuff were too cheesy, it appeared on me like this, I mean it was interesting idea to take five different students like that, but in this case they all were too onesided - like typical cliches of everyones idea about - jock, geek, rebel, princess and weirdo - it didn´t impress too authentically on me, more like paper charakters than true live people...and you praise the actors, but I can imagine better choices for these, I mean the two girls were cast just fine, but I didn´t like the boys, all three were not good, maybe at that time they were the best available for Hughes, but I can think of better ones. For the rebel would be perfect Johnny Depp or River Phoenix, but they weren´t ready maybe at that time, maybe Cruise would be perfect for the jock or even for the nerd, Nicolas Cage would be also great choice for some of the character. But I still think that it all made a too staged impression on me, but it´s only a matter of time in which I saw it. If I saw it 20 years ago, I could be more positive on it, maybe, I don´t know. But I think this film would look much differently if it was made 6-7 years later, at the beginning of 90s, it could have been much more darker and stronger with different actors. But that´s all just maybe, the film like it is, i wasn´t all excited about it. That other one, Bueller, that was just 100% better, wonderfull comedy and beautifully expressed the contradiction between the dullness of school and true life, in that Case Hughes did it just perfectly, It couldn´t be done much better and Broderick was also perfect in this role just as the other twoo actors - Mia Sara and Alan Ruck - all three were picked just perfectly and also Jennifer Grey was hilarious. This film has not aged so much like BK. I just rate Bueller higher than BK, that´s all. Interesting alternative choices for the characters! The Breakfast Club was groundbreaking in its day. For the first time, a filmmaker took the time to delve beyond the surface image of the various high school teenage personas. In other movies, teenagers of various types were stock caricatures. By forcing us to spend the day with them, Hughes cracked through the surface of five different teens and exposed their essence, backstories and vulnerabilities. Of course they discovered each other as well, (optimistically) laying the groundwork for improved respect.